Internal bleeding still comes with a very high risk of fatality. One new “drug” uses magnetically-driven nanoparticles to both stop bleeding and reduce blood loss. Every year, thousands of people die from internal bleeding. Data collected since 1997 shows that about 1 in 13 people diagnosed with internal bleeding die, and those numbers skyrocket to 1 in 5 for those who’ve taken a non-steroidal anti-inflammatory drug (NSAID) or aspirin. Gastrointestinal bleeding was recently attributed to roughly 20,000 annual deaths in the U.S. alone. This is an enormously painful and difficult-to-treat condition that poses a serious risk of fatality. 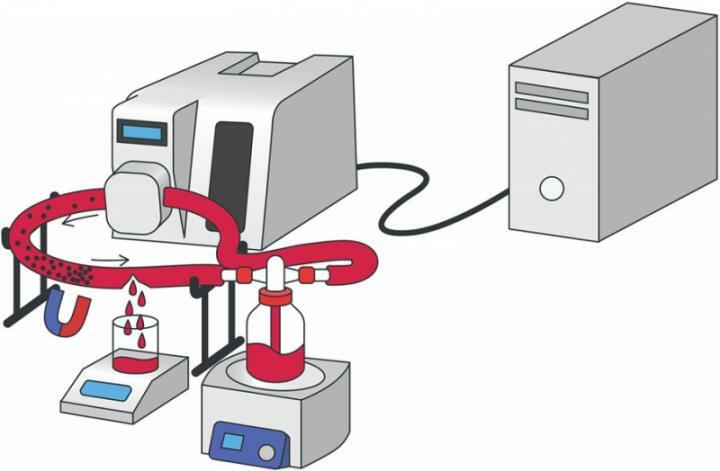 This research, published in the journal Scientific Reports, describes how a drug created using these nanoparticles can be injected intravenously, directly to the site of injury. When injected into a simulated blood vessel, this drug accelerated local clot formation by 6.5 times and reduced blood loss by 15 times — which is extraordinarily effective. A simulated blood vessel allowed researchers to test the efficiency of this “drug.” Image Credit: E. M. Shabanova, Andrey S. Drozdov et al. These miraculous-seeming particles contain a core of thrombin, an enzyme that triggers blood clot formation. Researchers then wrap the enzyme in a porous matrix of magnetite, the second main ingredient. This allows the nanoparticles in the body to be moved very precisely with an external magnetic field. Using a magnet, a doctor can move the particles and localize them to the site of injury. However, while these nanoparticles could be instrumental in reducing deaths from internal bleeding, they are difficult to make. Because this “drug” is bio-compatible, the researchers do not specify how they might remove the nanoparticles, but rather say they would be safe to leave in the body for a prolonged period of time. Further testing and investment will certainly be necessary, but as of yet is unclear how long it might be until this novel treatment is available to patients.